The English Immersion Program at the elementary school is an early partial language immersion program. Approximately 50% ～ 60% of the students’ instructional day is conducted in English. In grades 1-6 all English Language Arts, Math, Science and Life Studies classes are taught in English. The immersion teachers at Katoh School have developed an English curriculum to meet the unique needs of the students in the immersion program. 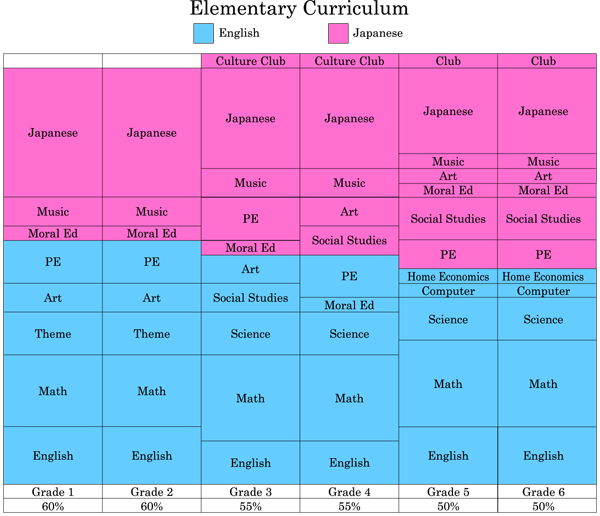 MEXT approved Japanese curriculum for Math and Science have been translated into English for use by students and teachers in the English immersion program. The same content is never taught in both languages, however there are weekly opportunities to review scientific and mathematical terminology in Japanese. Students in the immersion program are given the same unit tests, prefecture tests and standardized national tests as students in the Open Plan Program. Students in the immersion program are expected to achieve at the same level as students in the regular program.